What a great way to cool off in this custom made Unique Castle Combo with pool! Bright colors and custom design, this combo is one of a kind! 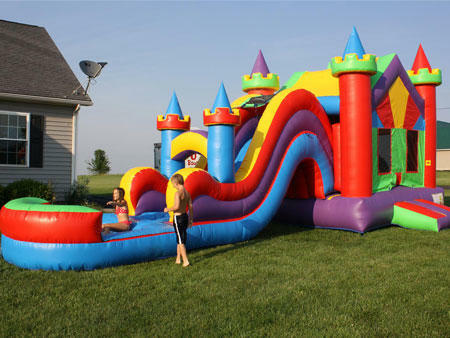 A combo bounce house is a combination of a bounce house and a slide in one inflatable. 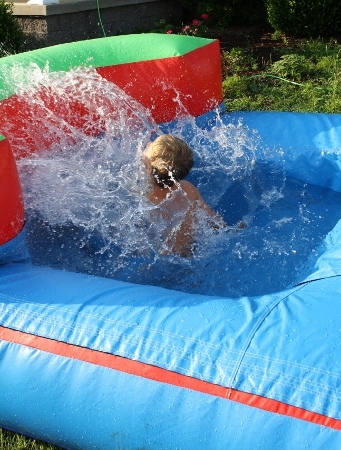 Water is an additional highlight of this inflatable! This water combo also has a added feature of a pool, which is wide enough to accommodate adults also! There is also a basketball hoop inside the bounce house and a great hiding place under the slide. 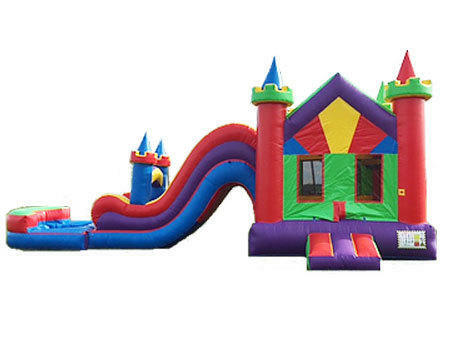 Rent the Unique Castle Combo Wet today and cool off on those hot dog days of summer! You will need a water spout with a garden hose for this beauty. Large Jumping Area, Slide & Pool! Reserve The Unique Castle Combo Wet Today!